Cooper Coursey, age fourteen, is entering his second year with Erie playing soprano. 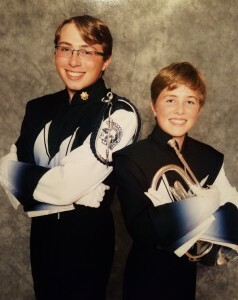 He also will be in his third year of playing mellophone with the McDowell Marching Band. He joined the Thunderbirds to follow the tradition Cameron had started. DCI was not a good fit for him because of his age and ability at the time. What he gets out of drum corps is having excelled from a music stand point. His favorite part though is going to the competitions and having the corps succeed. He and Cameron have different personalities, but being in the drum corps brings both of them together musically and as bothers! Cooper stated that “Cameron has always been a good leadership role model when marching with me in the corps, and we help one another out when needed”. In his spare time Cooper enjoys flying model airplanes, hanging out with his friends and going camping. Even though the Erie Thunderbirds are a small drum corps, they have another family story to tell with a surprising twist. Melissa Loringer is a color guard instructor with the corps. As a freshman in high school, a couple of her friends were in band and convinced her to join the next fall. Imagine her surprise when she came home and told her parents she wanted to join the band. It turns out that both her parents marched and met as members of the Thunderbirds which Melissa never knew! More on Wende and Chris Loriger in a minute. Melissa has marched color guard with Fairview High School, Top Hats a WGI Independent Open Class unit and the Thunderbirds. She joined Erie in 2014 and kind of fell into her role as a staff member. She was instructing a high school group at the time and had joined the Thunderbirds to expand her knowledge about the activity. Melissa ended up running a couple rehearsals to fill in for the caption head at that time and was then added on to the staff about halfway through last season. The best part of teaching for her is the ability to see the group grow through the season. She loves watching everything come together and the kids learning that they can achieve more than they thought they could when they started. For her, it’s all about the love of the experience and to share that as much as she can. Melissa’s mother Wende, marched with the Thunderbirds from 1977-1980 with the color guard and one season playing cymbals in the drum line. She and her husband Chris met through the drum corps in 1979 as both were leaders in their high school bands and saw each other as a part of that activity as well. Wende was involved in dance for about ten years and at age fifteen saw her first drum corps show locally and thought it would be fun to do. The activity has greatly changed since her marching days especially in the body movements in the color guard and throughout all the sections of the drum corps. The use of electronics and props added onto the competition field as well is different than back in the day. Wende does not miss physically marching, but does enjoy going to the local show and watching. Her most memorable moment was meeting her husband. She was actually going to quit drum corps in 1979 and Chris came to her house selling tickets for a fundraiser. They went out that evening and she decided to stay in drum corps. She tells everyone to this day that ‘ Prince Charming ” came knocking on her door! Chris Loringer, Melissa’s father was a member of Erie’s drum line from 1977-1980 playing mostly quads. He also was the drum tech, keeping the drums tuned, clean and ready for the performances. Chris was the drum major at Fairview High School and his band director at the time, David Hetrick, was a drum major in the Thunderbirds. David invited him to come to a rehearsal and the next weekend he was in Johnsonburg, PA carrying the largest bass drum he had ever seen and stumbling through a drill he didn’t know and that is how Chris became a member of Erie. Since his marching days, the level of complexity is much higher in today’s drum corps. Chris stated “The percussionists are playing things that I can’t even play while standing still! They are also incredible athletes who jump and dance with equipment while playing difficult musical pieces in multiple meters. Drum corps is truly underrated from a physical and mentally challenging perspective”. He does miss the thrill of playing the music and it still gives him chills when he hears the horns and drum melting faces. His favorite time was between the last rehearsal and the show that evening. There was usually a quiet time where we had a few minutes to rest, shower and eat something. He will always remember the nerves and adrenaline as we marched from the busses to the field to perform. It taught him a lot about handling pressure. The most memorable moment for him was obviously meeting his wife of thirty-four years. As in every drum corps there are stories to be told and memories to share. The bonding between the Coursey brothers, the love story between Wende and Chris Loringer and whose daughter, Melissa, NEVER knew her parents marched in the same drum corps she now teaches in! This is what makes our activity of drum corps so great and to last as long as it has.